To see your Oxford Dictionaries Word of the Year, just look up. That's right: it's literally not a word. The folks at ODW picked a pictograph - what we commonly refer to as an emoji - as the word of 2015. You've probably seen this face in your text messages and chats, but you probably didn't know its name, Face with Tears of Joy emoji. You may also know it as the Laughing emoji, Laughing Crying emoji, Laughing Tears emoji, or, simply, the LOL emoji. Though around since the late 90s', emojis (and the word "emoji") have seen an astounding increase in popularity this year alone. Partnering with SwiftKey, Oxford University Press found that Face with Tears of Joy was the most popular emoji used globally in 2015. Twenty percent of all emojis sent in the UK this year were FWTOJ, up from 4% last year, and the US usage of the pictograph jumped from 9% to 17%. You can't really argue with the effectiveness of emojis in conveying emotions, nor the universality of images over words. That said, it seems a littttllle bit of a stretch/grasp for relevancy to select an emoji as your word of the year, but maybe that's just us. 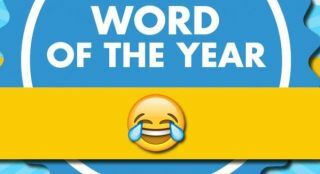 The Word of the Year 2015 shortlist included ad blocker, Brexit ("a term for the potential or hypothetical departure of the United Kingdom from the European Union, from 'British' + 'exit'"), Dark Web, on fleek, lumbersexual, refugee, sharing economy and they. Oxford provided a rundown of why these words made the shortlist.